In previous astrobites, we’ve emphasized how important spectroscopy is to an astrophysicist’s understanding of the universe. From radial velocity measurements involved in the discovery of planets, determination of the ionization history of the universe, characterization of P Cygni profiles and more, spectroscopic analysis is a crucial part of an astrophysicist’s toolbox. However, all of the quality of all of the applications we have mentioned are restricted by signal to noise limits inherent to sources at distances greater than our solar system. These sources are faint! If you are impressed by the results obtained by galactic and extra-galactic spectroscopy, be prepared to marvel at the extremely high signal to noise data that can be obtained by observing our brightest source in the sky, the Sun. The sun is truly a spectroscopist’s delight. Solar astrophysicists observe the sun through a variety of instruments such as solar telescopes, such as the National Solar Observatory and satellites, such as STEREO and the Solar Dynamics Observatory (SDO). Speaking of which, there has been a lot of recent solar activity on the arxiv, including these two articles. One of the most distinguishable features of the solar spectrum is the strong calcium II (singly ionized calcium) K and H lines at 3934 and 3968 angstroms, respectively. 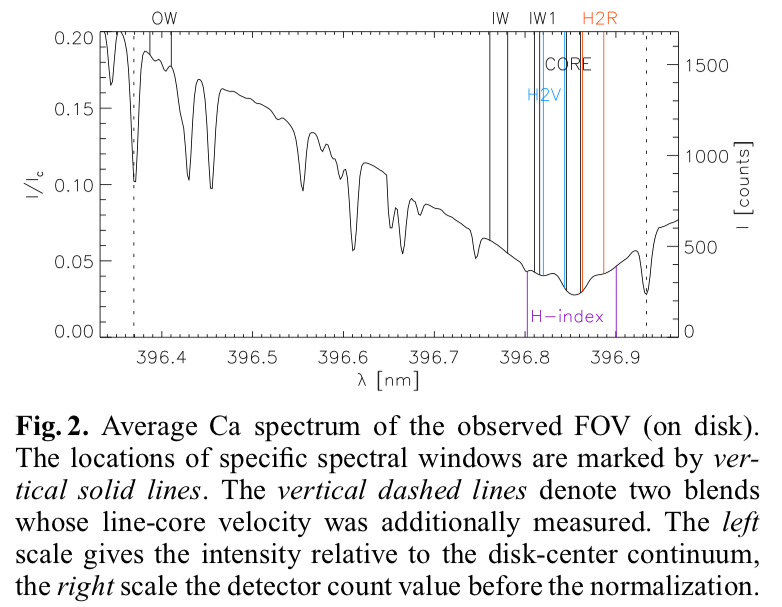 In their paper, Beck et al examine the Ca II H line (see Figure 2) at the solar limb using the German Vacuum Tower Telescope (VTT). They trace away from the solar limb, integrating (exposing, like a camera shutter) for 13 seconds per step. The instrument is capable of 1.95 pm per pixel at nominal resolution of . Wow! Solar telescopes are able to get away with splitting the light into such fine components because there are so many photons coming from the sun every second. For traditional (nighttime) astronomical spectrographs, , and integration times can be anywhere from minutes to several hours accumulated time. In order to investigate the structure of the chromosphere of the sun, the authors Beck et al. examine off-limb spectra, because at this position, the spectrum isolated from the background of the photosphere, making it easier to test models of the chromosphere. When modeling stellar atmospheres, stellar astrophysicists can usually safely assume that the layer in the atmosphere is in local thermodynamic equilibrium (LTE), ie, that the local region under consideration is all at nearly the same temperature. Understandably, this assumption makes modeling much easier. The study of the chromosphere at the limb is complicated for two reasons. First, the concept of LTE is not justified in the chromosphere; the chromosphere is just too varied and dynamic. Second, when viewing lines of sight along the limb, one may see contributions from many different regions where structures could be active, similar to the effect of viewing the setting sun through the high airmass of the earth’s atmosphere. 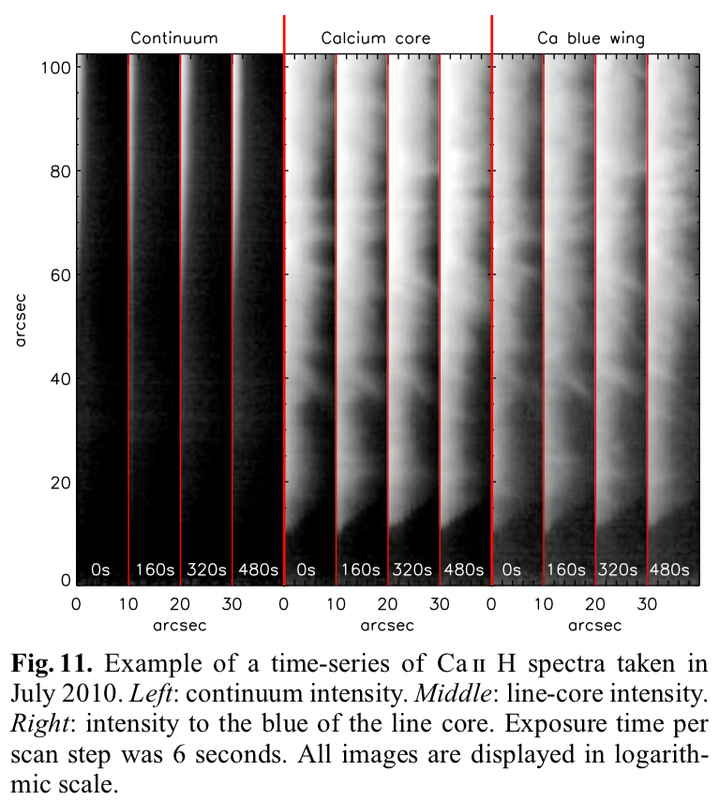 In order to determine the structure of the chromosphere, the authors calculate the energy contained in radiation from the line-core region by integrating up the flux in the line profile (See figure below). They find that this total energy decreases smoothly from the limb to a height of 4 million meters from the limb. The authors calibrated their images of limb to the images taken of the solar disk center, so the absolute intensity may be correct. Figure 5 from the paper: Top: Average off-limb spectra with increasing distance from limb. Bottom: Intensity variation with limb distance as a function of wavelength. (Captions from paper). Why did the authors choose to observe in Ca II H? Beck et al mention that Ca II IR triplet would be the ideal line (but is not matched to their instrument), since the Ca II H line suffers from partial redistribution of flux within the line. However, observing Ca II H is easier and cleaner than H alpha. 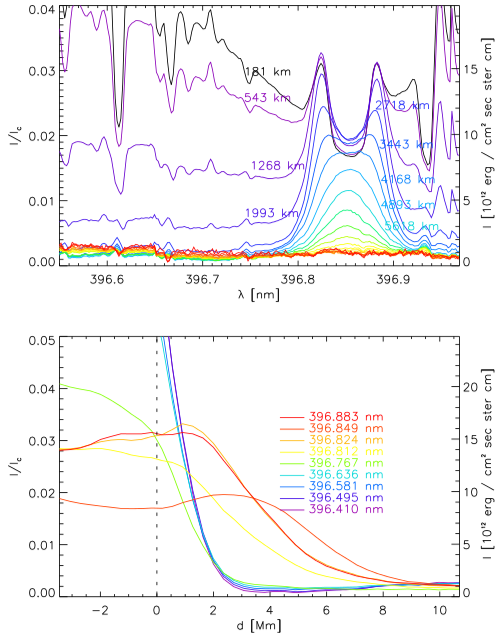 Figure 11 shows a time series spectra of the continuum, calcium core, and blueshifted Doppler wing of the calcium profile along the limb of the sun. Notice how the profiles change slightly with time. The authors say that thermal Doppler broadening is not sufficient to explain the width of the lines, because the line widths could not be produced based upon assuming the same temperature and thermal broadening. The authors find a correlation between the velocity of the Doppler excursions and their intensity. They offer two possible causes: one, that the solar structures rotate as a rigid body (such as a macrospicule), or two, that there are waves propagating along field lines of an intrinsically twisted tube, or at angle to the tube axis. Additionally the authors release their data set online for use by other groups. Public data release is becoming increasingly common in the field of astrophysics, and will encourage greater collaboration as astronomical data sets steadily grow in size.